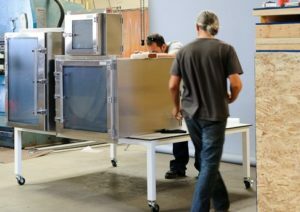 Cleanroom Synergy, LLC is a family owned business with a passion for excellence in cleanroom industry equipment and products. With over 35 years of experience we are a leader in the industry. Our team of professionals collaborate to design and build superior quality cleanrooms, cleanroom equipment, furniture and products ensuring the highest level of environmental protection necessary for your company products. Thank you for your interest in learning more about us. Cleanroom Synergy works with professionals in the medical, biotech, pharmaceutical, aerospace and food industries to name a few. Our strength is depth of knowledge, attention to detail, and precision in design+build of all cleanroom technology that will perfectly meet your company’s criteria for cleanroom construction and environment controlled equipment. Contact Cleanroom Synergy today to discuss your cleanroom needs. Each year Cleanroom Synergy donates 10% of its earnings toward underprivileged communities and also personally serves in missions at the local and international level. Serving, encouraging, loving.